Oogadishu where a number of Aideed's top officials were meeting in secret. The initial raid was a success. The assault force, inserted by Little Birds and Blackhawks, took the enemy by surprise capturing two dozen prisoners. 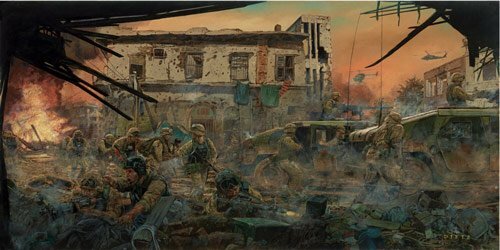 The Ranger ground-reaction force arrived on HUMVEES, loaded the prisoners and headed back to base.